how I’ll bend and break to sting you and how I’ll still be fine. myself from the duality of virtue, a human touch to haunt me. 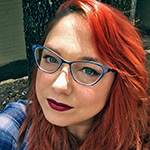 E. Kristin Anderson is an author, poet, Starbucks connoisseur, and glitter enthusiast who formerly made magazines with The New Yorker and read submissions for Found Poetry Review. Currently she’s an assistant editor at The Boiler and an editorial assistant for Sugared Water. She is the editor of the literary anthologies Come As You Are (Anomalous Press) and Hysteria (Sable Books, forthcoming), and is the author of nine chapbooks including Pray Pray Pray: Poems I wrote to Prince in the middle of the night, A Guide for the Practical Abductee, Fire in the Sky, 17 seventeen XVII, and Behind All You’ve Got (forthcoming). Kristin grew up in Maine and has a B.A. in Classics from Connecticut College and currently lives in sunny Austin, Texas.